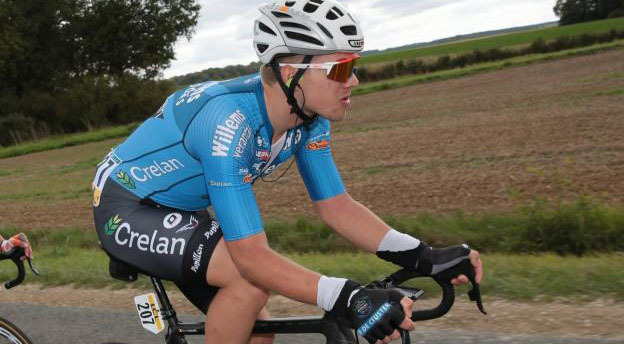 ROUBAIX: Belgian cyclist Michael Goolaerts died in hospital on Sunday at the age of 23, hours after suffering heart failure during the gruelling Paris-Roubaix one-day classic race in France. “It is with unimaginable sadness that we have to communicate the passing of our rider and friend Michael Goolaerts,” the rider’s Veranda’s Willems team said in a statement on Twitter. “He died of cardiac arrest, all medical assistance was to no avail,” the team said. The Belgian — competing in the one-day classic for the first time — had been airlifted to hospital after being found unconscious and not breathing by race doctors at the side of the road on one of the race’s famed cobbled sectors, about 100 kilometres into the 257km course. “For now there will be no further communication as we want to give his close ones time to deal with this terrible loss,” added Veranda’s Willems in their statement. The race is known as the “Hell of the North” because a large part of the course is made up of cobbles and the riders have to contend with muddy conditions. Just two years ago, another young Belgian rider, 22-year-old Daan Myngheer, died in hospital two days after suffering a heart attack on the Criterium International in Corsica. In 2011, Belgium’s Wouter Weylandt died in a crash during the third stage of the Giro d’Italia. Sunday’s tragedy completely overshadowed the race itself, won by Slovakia’s three-time world champion Peter Sagan. Sagan outsprinted Swiss champion Silvan Dillier, the last survivor from an earlier break, in the iconic outdoor velodrome in Roubaix after 5hrs 54mins 06sec in the saddle, to win the race. Sagan paid tribute to Goolaerts’ on Twitter, writing: “All the thoughts and prayers of the @BORAhansgrohe team and myself are with Michael Goolaerts. Such a sad news…”. Last week’s Tour of Flanders winner, Niki Terpstra, was third at 57sec and 2017 champion Greg Van Avermaet fourth at 1:34.